ROMANTIC CHAPMAN'S PEAK SUNSET TRIKE TOUR. 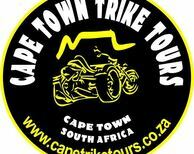 A romantic sunset trike tour for two to one of the world’s most scenic marine drives via the Atlantic Seaboard and beautiful Hout Bay. For the romantic at heart, this is the perfect gift for that special person in your life. The tour starts with collection from the V&A Waterfront approx 2 hours before sunset. We travel through Cape Town, along the Atlantic Seaboard via Sea Point to Camps Bay where we’ll stop for a photo opportunity and to stretch the legs. From there we make our way further along the Atlantic Seaboard to Llundudno for another photo stop. From here it’s down to Hout Bay harbour for a rest stop and even a chance to personally feed a seal. From the harbour, we ride up onto Chapman’s Peak drive, voted as the second most scenic marine drive in the world, where you will enjoy some tasty finger snacks and an ice cold bottle of sparkling wine whilst watching a perfect African sunset with Hout Bay as your backdrop. The views from here are simply breathtaking. To complete the perfect day, why not combine this tour with one of our other tours...speak to us for a special package. Collection approx. 2 hours before sunset. Finger snacks and a bottle of sparkling wine included. Other food & drink excluded. Please dress warmly even during summer. Hi, I am Willem, Professional tour guide. in Cape town. I’m passionate about Biking, triking, and music.. My Motto: TRIKE IT...YOU'LL LIKE IT. Mother City! We salute you! Cape Town is one of a kind and juggles contrasts like no other city on this planet.